Hi loves! How are you today? This is a scheduled post as I am busy tonight with some beauty regime, tomorrow night I am attending the wedding party from the beautiful Lindy! So, shaving legs, plucking my eyebrows, painting my nails, washing my hair... there is a lot to do haha! Today I am showing you a manicure I L-O-V-E-D ♥♥♥. I started with a base of China Glaze Fancy Pants. It applied easy in 2 smooth coats, I really liked the formula on this one. After it dried (quickly) I used Wet 'n Wild Black Crème and Konad plate S6 to stamp my middle and ringfinger nail. My pinky got 2 little black studs, my index 1 at the bottom, and a square stud was placed at my thumb (it wouldn't photograph properly, bad thumb!). 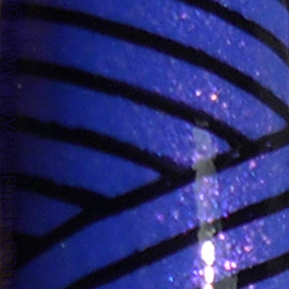 Some topcoat, which really emphasized the GORGEOUS shimmer in this polish, and I was done! Do you own China Glaze Fancy Pants? Nice pants! Fancy Pants that is ! It is sitting by my elbow, untried, why I wonder? It is astunner! I love it! And I do have Fancy Pants and I LOVE it! I own fancy pants, very pretty mani! I bought this ChG shade when I hit out of town Sally's close to where my surgery was going to be. I had not planned to get any from this collection - but this one was one of the few left and the pretty pink shimmer in it got my heart! I have it on my toes thanks to a lady who put it there as I cannot bend to reach them right now post surgery still. I cannot wait until I am home with my polish collection and put one of a # of toppers I am thinking about over this to pull out more of the pink shimmer - like one of my CND Effects or maybe one of the Cult Nail toppers...or even one I turn to a lot that was a scented Revlon from 2 summers ago called Pink Grapefruit - that one might work too over this. I love your stamping over it and the studs. I am loving this too. Such a great mani. I have a bundle monster plate similar to this. I will not buy this polish....I will not buy this polish....(I'm really trying to restrain myself). I love what you did with this polish! Looks great, and I love those studs! The design is beautiful too! Had fun at the wedding? I do not own this colour but now I want it! Your stamping looks perfect! I can only hope you've put it on immediately ;-)? I had it untried for too long myself and I am so happy I finally tried it! Aww thank you Liz ♥. It gives great contrast right? And YES this is a must have :). Go and try it, you'll love it :D! I am thinking it'd make a great base for Max Factor Fantasy Fire, too! I can imagine you love it :D such a beautiful shade! Thanks Nicole :) so many Fancy Pants lovers here ♥. Ooooh go wear it, wear it nooooow :D! Thanks dear ♥. Yes, that shimmer! It totally takes your breath away! That's very sweet, to paint your nails. I can't imagine not getting by my toes myself, it would be so annoying! The only shame indeed is the shimmer could have been a little bit more apparent - though a glassy layer of topcoat really helps. Thanks for your sweet words dear! OH YES BUY THE POLISH ♥♥♥. Haha yes! I did all the beauty stuff last night, picked the outfit, everything is already hanging together, so tonight I "just" have to make-up and such. :( rough month money wise? Well, I am guessing it will still be around next month :). Thanks! The wedding is actually tonight, so hopefully it'll be fun indeed :). Thanks so much, and welcome ♥! Hope you enjoy the posts! The name of this polish always make me chuckle, I want it just for that. Your stamping is gorgeous babe! Very crisp! Black studs are so classy *___* the whole job here is so classy, even if the colours could not be considered classy at all (by the majority of people, I mean :D - to me, any sort of black blue and violet is an ordinary colour :D). You absolutely need it if only for the name :D! Thanks dear, I was very happy with it too! Thanks dear! Total musthave this beauty! Thanks so much dear, that's really a nice compliment! Can't wait to see what your version looks like :).